No, wait, that’s not right! 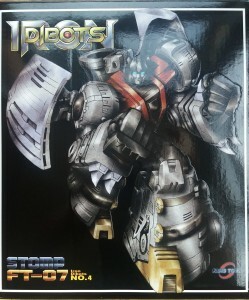 I received this bad-boy over the weekend courtesy of the great guys at Kapow Toys, the fourth release from the Fans Toys Iron Dibots line; Stomp, an obvious homage to Dinobot Sludge. For many people this completes the set as a lot of people are happy with MP08 Grimlock in dinosaur mode (lets ignore the stupid New Rock boots that came with Scoria), or they may have invested in the Reximus Prime over-sized KO of MP08, for me – given the quality of this piece – I already have my pre-order in for their unfortunately app-named Grindr. As many of you know, I am something of a line-whore. As such, when I received Scoria (Slag), as impressed as I was with the sheer size of him, I didn’t fall in love with him. It didn’t help that mine was partially damaged preventing the back-pack folding away properly in robot mode. Their Swoop analogue Soar was well received by most, but I felt the neck joint for dinosaur mode prevented it from being all it could be, but I loved the fact you could chose between TV accurate blue or comic and toy accurate unified red. 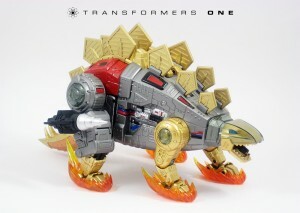 Snarl was my first Dinobot as a kid, so as such Sever was eagerly anticipated, but scary hip joints in mine limit how often I pick him up and fiddle with him. Enter Stomp; a Sludge homage who is very, very impressive. The team is really coming together now! Stylistically, he fits right in with his team mates (I’m saving the group shot for all five of them together), and he looks great. Out of the box, you notice instantly how heavy he feels, often seen as a mark of quality. Coupled with great joints, it’s nice to see the quality backs up the heft. He comes with his sword which fits nicely into his hands, and a hang-gun that looks more like his old missile launcher than his G1 hand-gun. 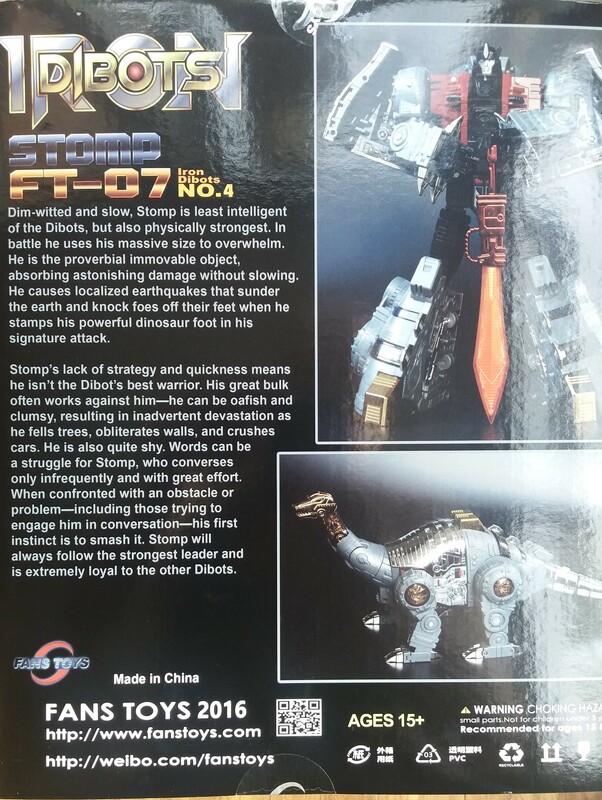 This is a bit of a disappointment, as the rest of the DiBots have come with their hand guns (obvious exception being Soar), and the missile launcher doesn’t launch, or clip-on to the dinosaur mode – I’m not sure if that’s an option that people want, but to me that would make it more complete. 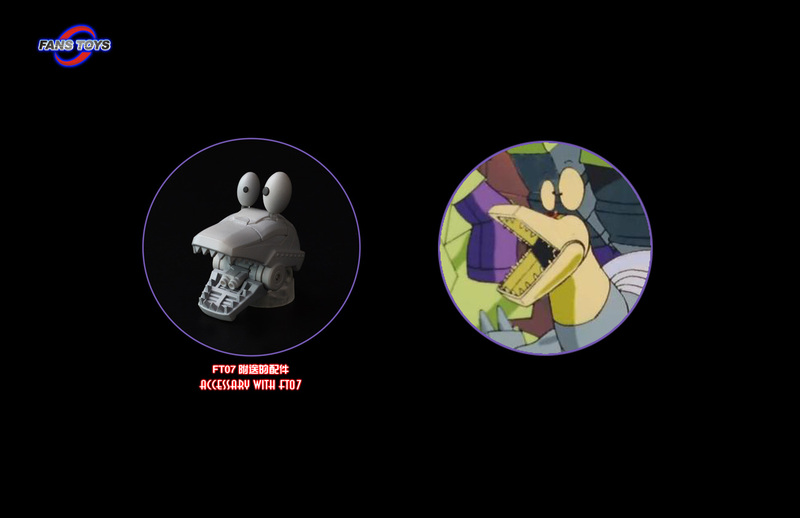 The one major change over the original toy that I’m sure 99% of people will be very happy with, is the new animation model style head, which of course was also used in the comic. 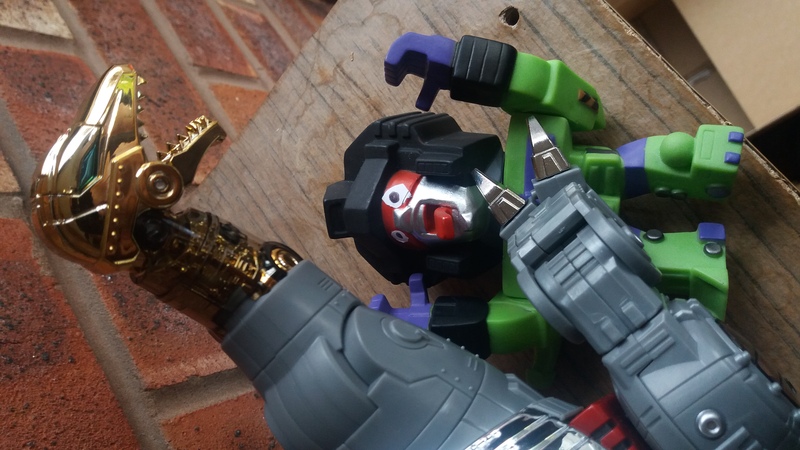 He comes packaged with some new parts for Sever which shows Fans Toys commitment to aftercare too, as well as swap-able cartoon eyes to re-create the controversial scene in the movie (some people hate that scene), and a little screw-driver to help replace it. It’s a great add-on, but one I will never use as I don’t want to risk ruining the lovely chrome on his head. 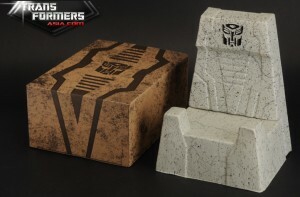 If you’ve ever held the G1 toy, you know pretty much what to expect from the transformation. I know I’m normally one to complain about toys packaged in robot mode, as the first transformation should be the reveal (stop me if you’ve heard this), but Stomp’s transformation is very intuitive and he was no problem to get into dinosaur mode WITHOUT INSTRUCTIONS, which to me is the mark of a fun transformation. 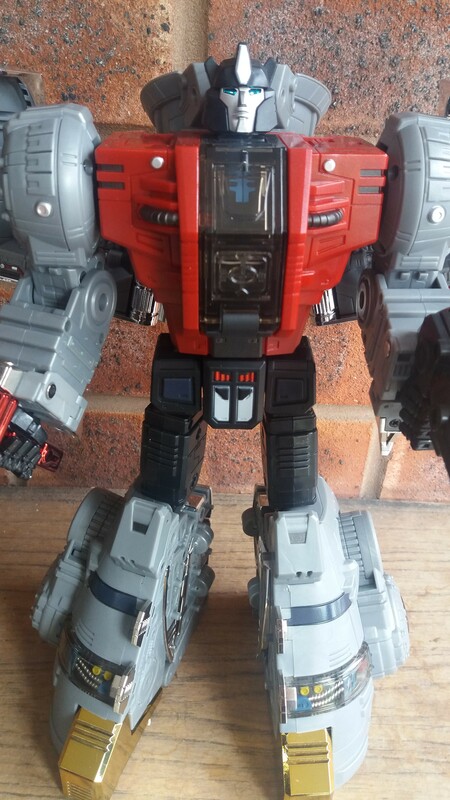 The legs can be tricky, and because I was relying too much on the G1 to guide me, I missed the thigh extender for a while, but everything comes together very nicely. Like his DiBots counterparts, great efforts have been made to eliminate or minimise the amount of animal leg kibble visible on robot mode to stay faithful to his animation model, and they do this by once again following the path laid out by the excellent MP08 by utilising inner leg space, leg space which also contains his tail. They fit a lot in, but again, everything works very intuitive and I guess it’s sad that we take this innovation for granted, but at least the figure does what we want it to. For me, the greatest “eureka!” moment with this figure was the rear dinosaur legs, with the lower leg very neatly storing away inside the upper leg. Genius! Genuinely brilliant. The way the “toes” splay on the front legs to assist the robot hand storage is also very neat. In alt. mode, oodles of chrome which is mostly lost on the robot mode make this guy pop. A lot. His tail, upper torso and claws look great, as do his gold parts. 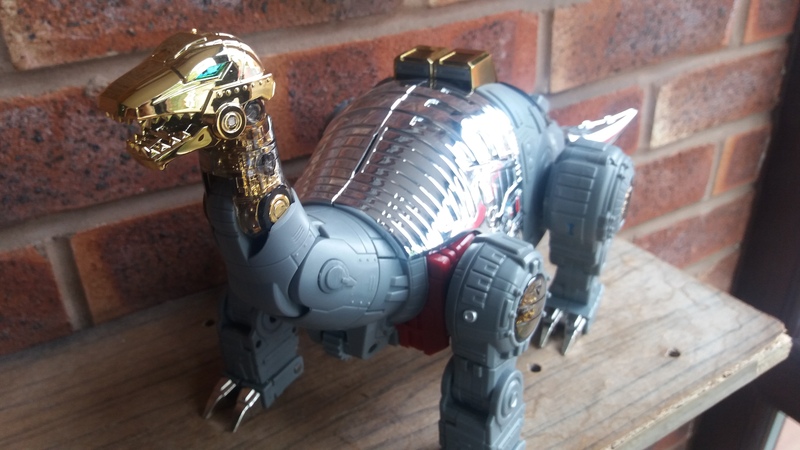 He has three points of articulation in his head and a working jaw, one which hides an almost-standard-by-now-gun-hidden-in-dinosaur-mouth. His front legs are very poseable – a huge improvement on the G1 – with a thigh swivel and the toe movement helping to make Stomp a bit more stompy. His rear legs are a bit disappointing, as they only have lateral movement, albeit two points of it. His tail has two points of articulation, and is held nicely in place for plenty of tail-wagging. I like this guy a lot, definitely my favourite of the set. Both modes look great and he’s fun! His rear robot mode torso maybe feels a bit hollow, but then that’s done to help his dinosaur head fold away to minimise kibble and it works well, but I will miss storing old chewing gum in his chest as I did with the G1 toys as a kid (what?!?). If I had to nitpick one problem with this entire line, it would be that there is zero weapon storage. That seems VERY, VERY odd in 2016. I get that in some ways they are limited by the G1 inspired-transformation, but many other 3P companies still find a way to store weapons, and at the least Takara have figured out a way of sticking the weapons on car mode for an attack mode, and let’s face it, that DOES have a precedent with G1 Dinobots and their missile launchers being able to weaponise the dinosaurs, something that the Gigapower figure actually utilised (which you can read about here on the always excellent Square One blog by Maz. 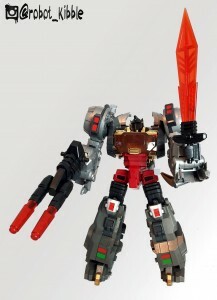 I’ve often had this thing where I like Sludge to be MASSIVE, as in, bigger than Grimlock. As such, for a while there I was considering waiting for the Gigapower Sludge. Well, given that Fans Toys are 4/5 and Gigapower are still only 1/5 with what I felt was a way too big Snarl with Guttur, I think my choice to stick with Fans Toys is a wise one. Nothing to do with this review, I just love this image. 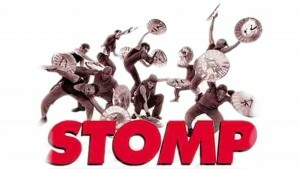 Stomp and many other Fans Toys products are available from Kapow here. 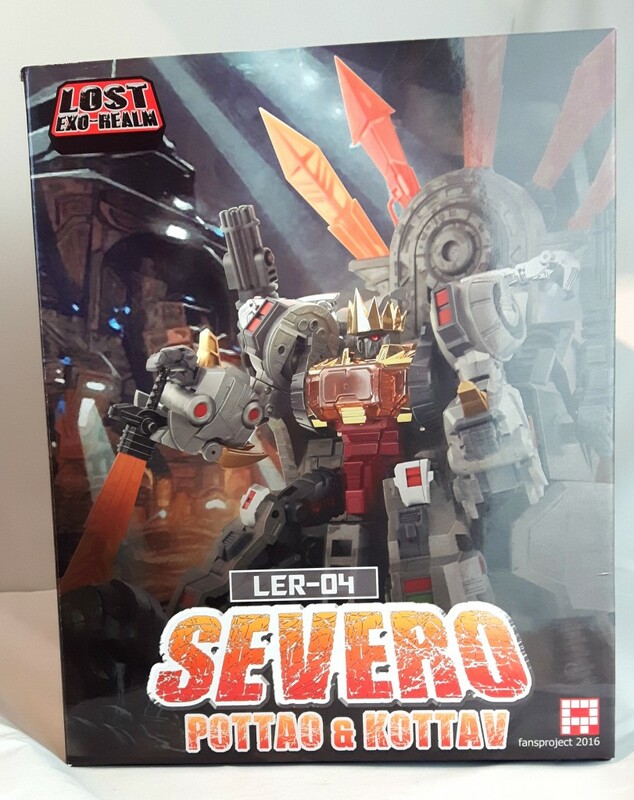 I just got a brand new toy in to look at, the fourth in the Fans Project Lost Exo Realm; Severo. I’m quite a fan of FP, I’ve been collecting their stuff since City Commander hit, and have bought pretty much everything they’ve released since then. 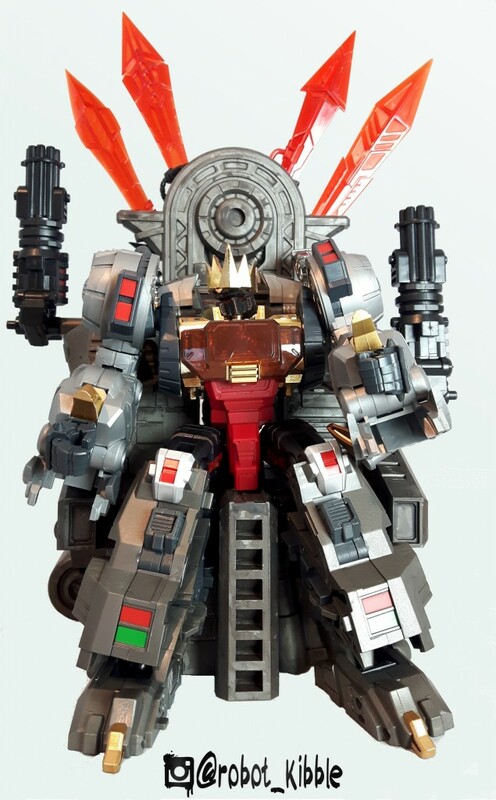 Some would say the once undisputed kings of the 3P game have fallen from grace, thanks to Maketoys, MMC and Fans Toys, but another way of looking at it is that FP are keeping it real with their own design choices and aesthetic, rather than switching out to the fashionable choice of Masterpiece style. 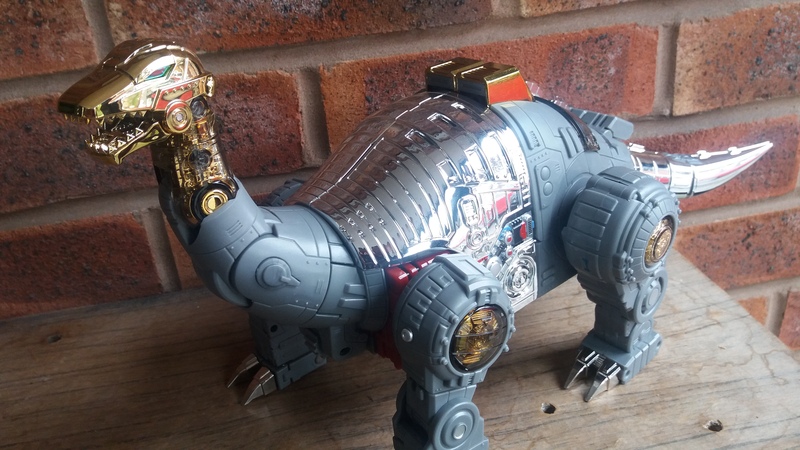 Which leads to the question; in a world where most collectors have switched to MP, are the Lost Exo Realm figures needed as Dinobots? Lets look at the competition; Toyworld have finished their set which started strong and seemed to lose some along the way. G-Creation Shuraking are over half way through and seem to have really found their audience though there are rumours this might be their debut and swansong. 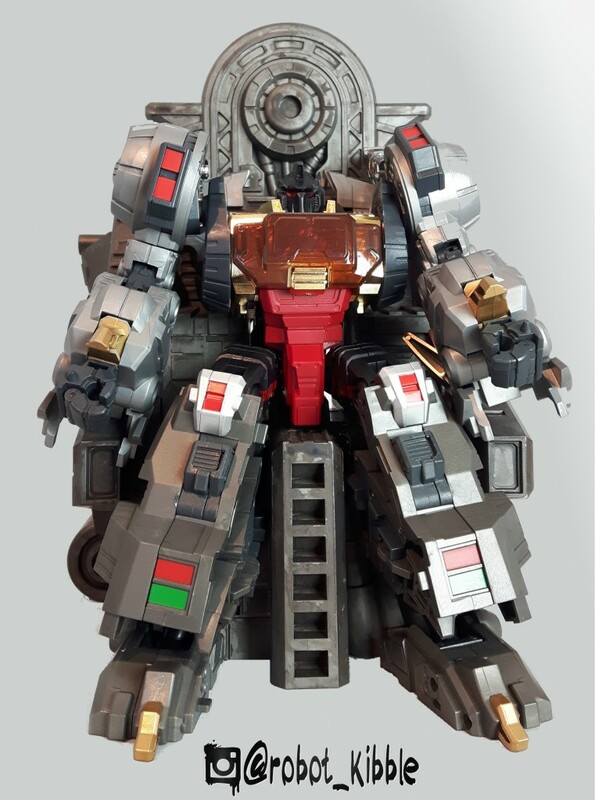 Fans Toys keep on keeping on with their MP Iron Dibots, with just Stompy to finish the set and their own version of Grimlock as Grinder for those who no longer wish to keep MP08 (original or OS KO) wearing high-heels. 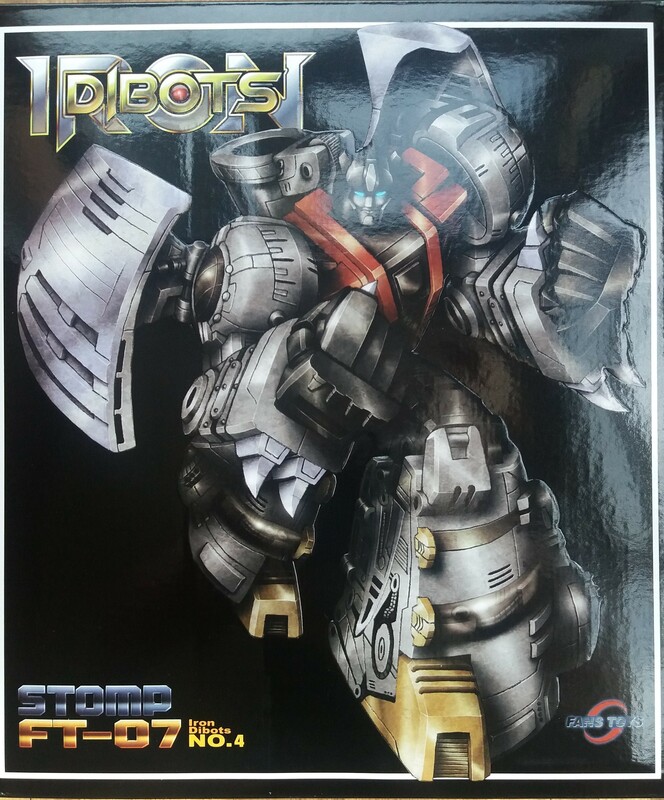 Gigapower still seem intent on releasing their second offering, they might be missing the boat, but offer the biggest bots on the block to compensate. 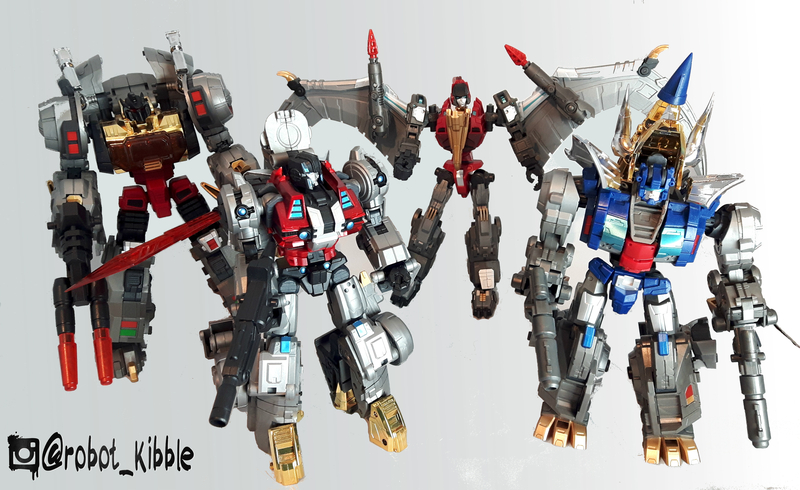 Last but not least we have the incredibly cool, solid and no drama Fall of Cybertron style figures from Planet X – all five of which are out and looking awesome, with an additional Paddles retool of Sludge for those that need the sixth member (which includes me). 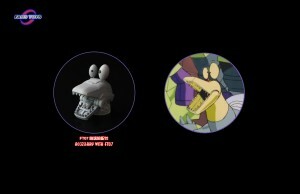 So with all those in mind, do FP’s Dinos still have a place? 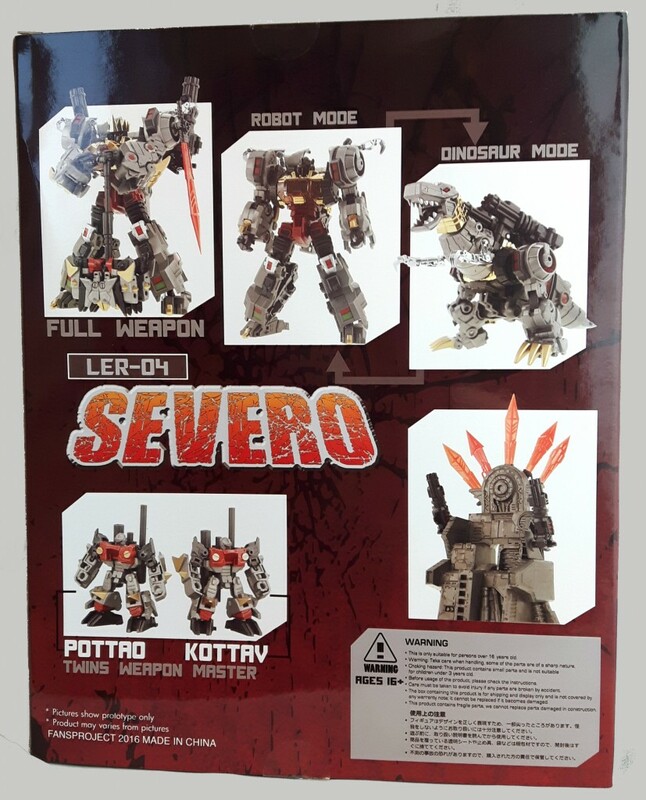 Let’s have a look at Severo, their version of Grimlock, and then make a decision. Long Live the King, the King of Kings. Usually, I’m quick to moan about figures packaged in robot mode; I think alt. mode packaging gives us a valuable fun first transformation (nearly always easier to unfold a figure without instructions than collapsing a robot back down), coupled with the actual reveal of the robot which harkens back to the promise of those original 80s toys: Robots in Disguise. 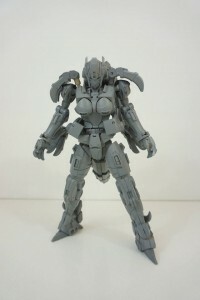 With this figure, I will make an exception. A throne fit for nothing. He’s not the first Grimlock to come with a throne, even the official MP08 figure has had an official throne released, but the difference in quality is worlds apart; the FP version is a solid mold made of durable plastic with a quick wash to give it some texture and bring out the detail, and is also a two piece construction like the Hasbro offering, but screwed together. If you dropped a screw on the Hasbro version, it would probably tear through it. 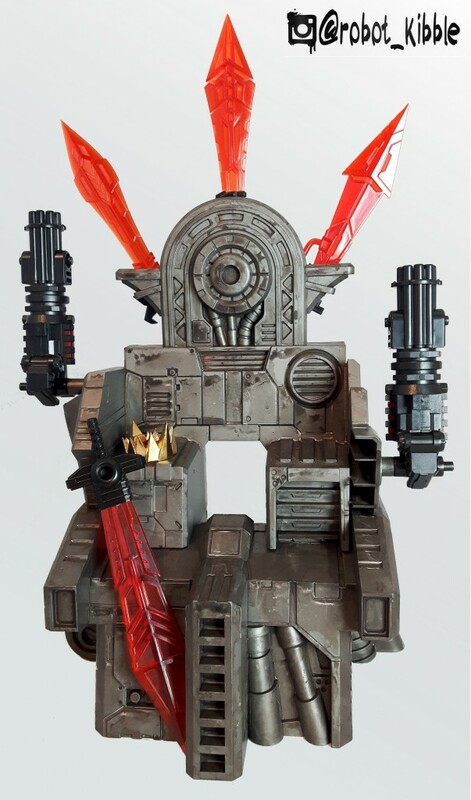 Severo’s throne just looks cool, and the option to store weapons on the rear is a sensible one, especially with the Game of Thrones style sword arrangement. Even without the final figures released and only swords available, this works very well. Very cool FP, very cool indeed. I can see people buying the rest of the Dinos just to collect the swords to make this an amazing diorama. 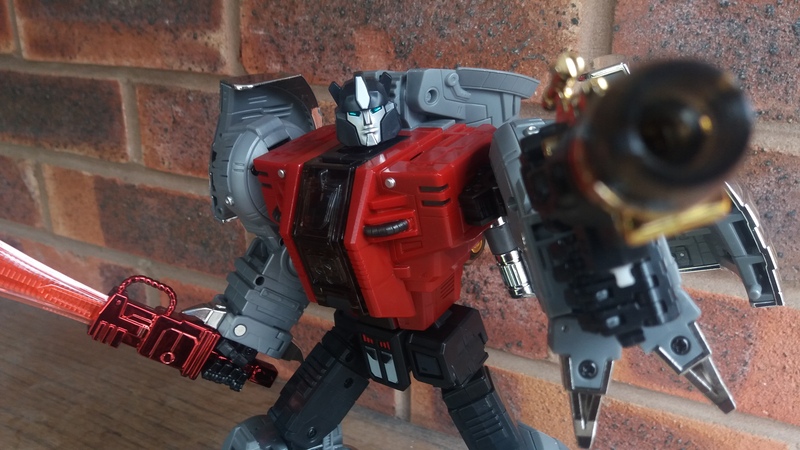 And yes, it includes a crown, slightly bigger than the MP08 version, which actually gives Severo a bit of a Jothri feel, making him look more petulant and dangerous. His robot mode is exactly what you expect; big, strong, and angry-looking. This is a Grimlock that means business; more Marvel Comics than Sunbow animation – Blaster wouldn’t stand a chance. I wasn’t expecting it, but there is a nice bit of detailing on the back of his arms which gives a little nod to the War Within Grimlock robot mode (a personal favourite of mine and one I hope to own better executed than the Titanium), it’s little details like this that show the care and attention FP put into this guy, drawing on multiple versions of the character for inspiration. 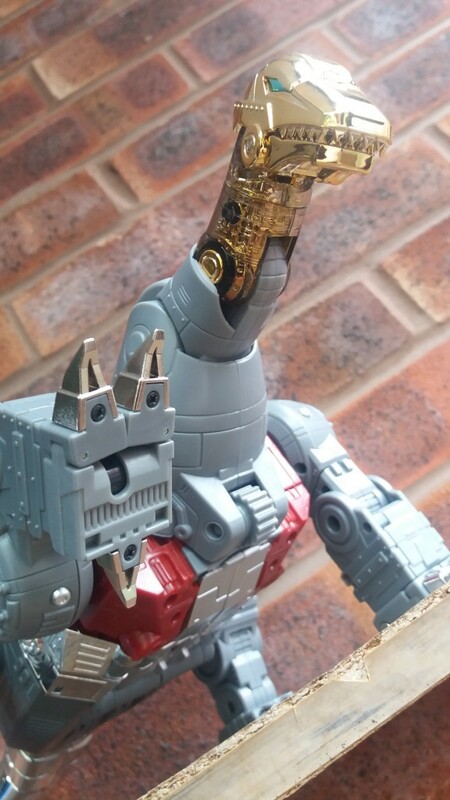 The head sculpt is interesting, managing to go classic and feral without the overly detailed “exposed teeth” design that has been popular for the character since Maximum Dinobots – I don’t miss it. 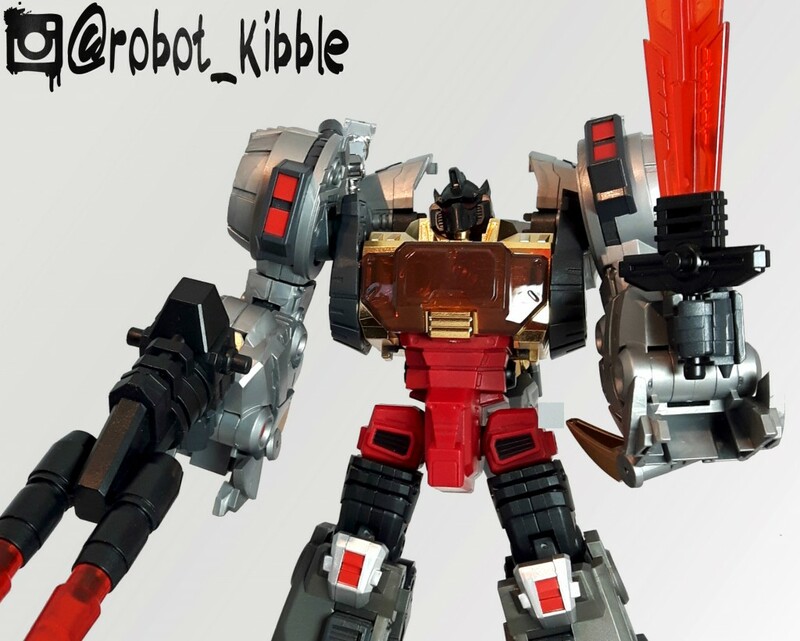 He has chunky hips, but nothing distracting, I only mention it because stylistically he closest to the Toyworld re-imagining which – in my opinion – suffered from child bearing / combiner hips. 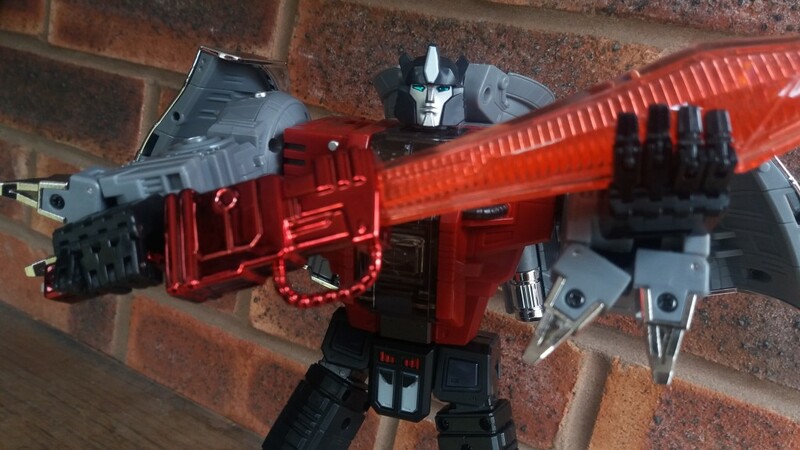 He comes with his popular G1 style gun and sword, as well as two massive extra miniguns which work really well on dinosaur mode. As is tradition with the retail release of the Exo-Realm, he has Target Master style companions, not one, but two. Pottao and Kottav are mean looking little bruisers that look like they could wipe the floor with most other Solerons. 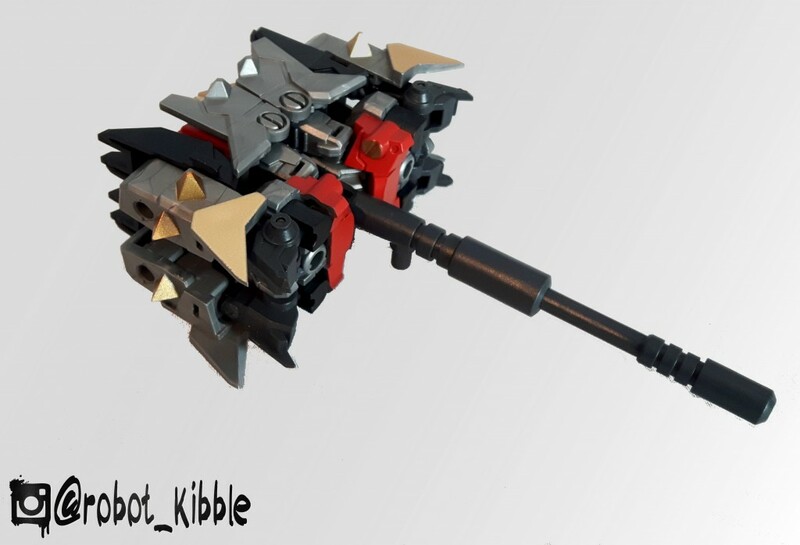 Each can become a melee weapon, but it’s when you combine the two together into it’s final Melee-Master form that you get a mace like weapon that totally suits old Grimmy. I mean Severo. 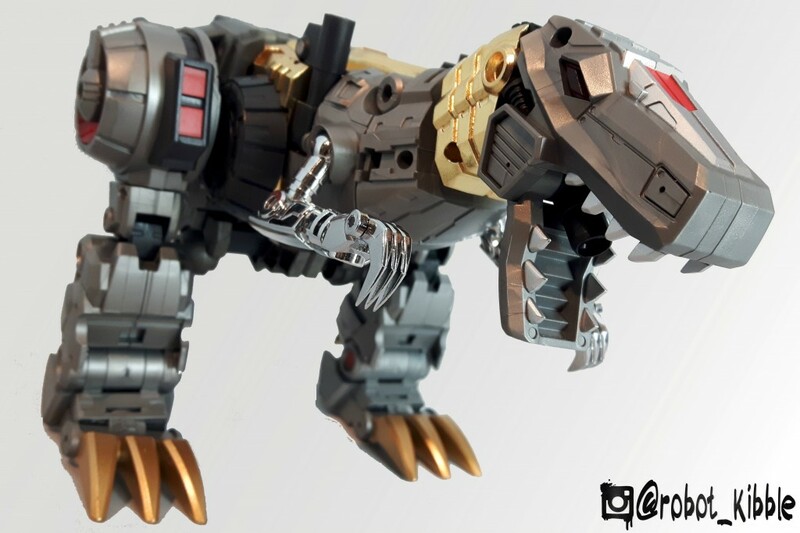 No, I mean Grimlock, this guy is every inch Grimlock. The transformation is fun, easy and instinctive, enough so that I have been able to do it without instructions both ways. Obviously, the transformation borrows a lot from previous Grimlocks, who mostly all follow the standard G1 transformation (except Pretender Classics and Don Fig’s CHUG update), which makes him a bit easier to handle ‘structions free, and the legs borrow more than a little from the MP offering. So onto Dinosaur mode, how is he? Honestly, I feel like the neck is too long, and the tail too short. The neck is probably about right in all honesty, we just expect Grimmy to have a shorter neck due to the original toy and animation model, and I think it looks better than the Toyworld version in all modes for a comparison – as I felt that had a looong neck. The tail could have down with an extra fold to enable it to be longer whilst still storing in alt. mode, but it’s a small complaint. It also would have been nice if his claws were separately articulated like the MP, but this might be a good thing given how sharp they are. Also, I’m not a huge fan of the joints that hold his wings / dino upper chest in place, as they sort of stick up in dino mode, mostly because they double as weapon pegs and posting the miniguns in place does mitigate this look massively, but when un-weaponed they are noticeable, and for the sake of 3-4mm, then could still be functional and less obvious. 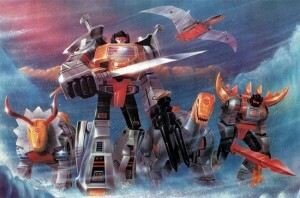 Other than these complaints, he looks great in dino mode, especially with his team-mates. So, does he fit in a collection? Absolutely, though it depends what you want him for. 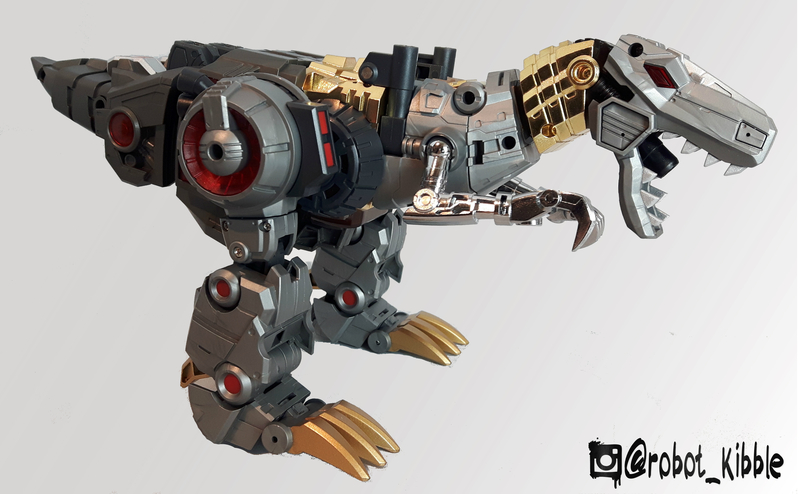 If you just wanted a single Grimlock all on it’s own; I recommend MP08 above this, as I love that toy a lot. However, toys don’t exist in a vacuum and Grimmy needs his team mates. If you’re looking for MP style, you currently cannot beat out Fans Toys. If you want combining Dinobots (always controversial to some in the fandom), there are other choices available. 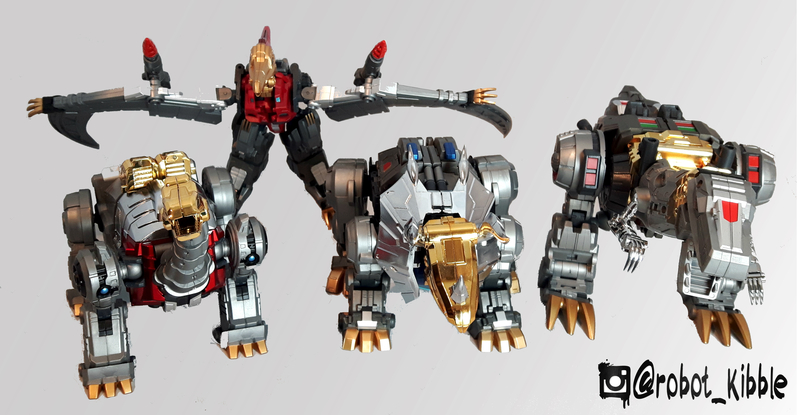 If you want stylised FOC guys, see Planet X because really, they are awesome and their Grimlock analogue Vulcan is extremely awesome. However, if you want a decent re-imagined Dinobot team for your Classics Collection, then I feel that the FP Exo-Realm are the way to go. The CHUG figure is almost ten years old now (ye gods! 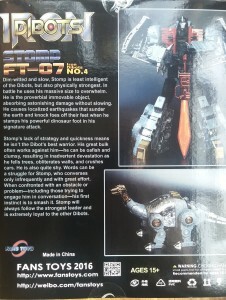 ), and wasn’t a great figure in its day and has remained all on his own for all that time (although, when you know it’s an update of Pretender Grimlock not G1 Grimlock it makes a lot more sense). Solerons: Diaclone Drivers and Melee Masters. The Lost Exo Realm are definitely more than the sum of their parts. Each release has bolstered the other releases and the closer we get to them being a team, the happier I am. Are they flawless? No. My Columpio needs wrist joints and I always want my Sludge’s to be bigger, and he still needs me to do the hip swap but the after-care replacement parts were at least provided. I don’t like Cubrar / Slag’s head and his Splinter Cell goggles, but the chrome horns really pop. I wish Volar / Swoop had more in the way of locking the legs into place and hiding his hands, but he comes with a choice of bodies and look at that wingspan! As a team of re-imagined Dinobots, these guys are the best game in town. Once you factor in all their weapons, their Melee-Master companions or Diaclone Driver tributes (depending on if you go for the regular releases or convention exclusives), and their choice of G1 or Diaclone colours, they really do become a set that will please most CHUG collectors. I look forward to their Snarl and their mysterious Fembot completing the team. 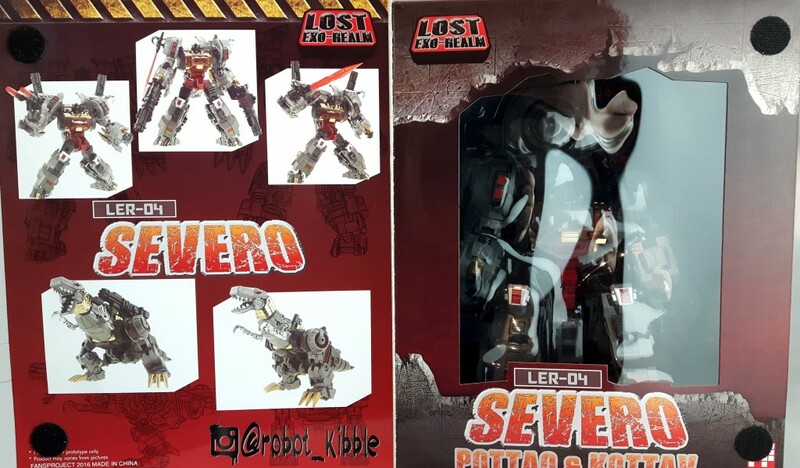 Severo is now in stock and available to order from Kapow Toys.